A new era of restricted freedoms and increased governmental control could undermine social, political and economic stability and increase the risk of geopolitical and social conflict.1 Empowered by sophisticated new technological tools in areas such as surveillance, governments and decision-makers around the world are tightening control over civil society organizations, individuals and other actors. Over the past 10 years, multiple sources from within and outside the civil society sector have pointed to deteriorating rule of law and declining respect for basic civil and political rights at the global level.2 New regulations and restrictions are ostensibly intended to protect against increased security threats, but potentially threaten the existence of an open and free society and the stability of the environment in which businesses invest and operate. Civil society actors have historically been integral to driving progress and innovation in the political, social and economic spheres – by advancing human rights, the rule of law and sustainable development – and they are currently at the forefront of efforts to tackle global challenges such as the migration crisis, implementing the United Nations’ Sustainable Development Goals (SDGs), and promoting transparent governance. Closing space for civil society reduces the chances that these challenges will be effectively addressed. This chapter will explain the current challenges of a closing space for civic freedoms and solid rule of law, casting a light on the triggers and contextual factors that are contributing to the phenomenon. A separate focus on the implications for businesses and society at large is also provided to highlight the medium-to-long term impact of this trend and the issues at stake in the global context of a fraying rule of law. Factors behind the closing space for civil society vary per region, though Table 2.2.1 summarizes some common dynamics. In some cases, security concerns, protectionism and the changing global aid landscape have been used as reasons for reducing dissent. In other cases, restrictions on freedom have been unintended byproducts of well-intentioned security packages. While it is possible to try to distinguish between the trend in authoritarian or semi-authoritarian and democratic countries, worrying trends are seen even in democratic countries. Genuine problems among a subset of civil society actors – such as a lack of transparency and links to terrorism – do exist, but responses are drafted widely enough to affect reliable organizations delivering benefits to society. 1 Carothers and Brechenmacher 2014, p. 9; Greenslade 2011; OHCHR 2014b. 2 Palumbo-Liu 2016; Sokatch 2013. 3 Such accusations have been made in several countries, including India, Pakistan, and Malawi (see Doane 2016; ICNL 2016a; Jafar 2011, p. 133). 5 Rutzen 2015, p. 7. 6 Doane 2016; Funders’ Initiative for Civil Society 2016, p. 9; United Nations Special Rapporteur 2016. In India, the Intelligence Bureau claimed, in a leaked report, that civil society prevents GDP growth by 2–3% per year. Technological advances have expanded civic space by providing citizens and organizations with new opportunities to make their voices heard, express their grievances and demand their rights, and innovative ways to hold decision-makers to account. They offer virtual platforms for citizens to engage and mobilize on issues they care about. At the same time, ICT and other technological tools benefit individuals or groups seeking to leverage technology for the spreading of hate, misinformation and extremism, and present challenges for law enforcement and other governmental authorities attempting to monitor terrorist activity. Technological tools are also being used to increase surveillance and control over citizens, whether for legitimate security concerns or in an attempt to eradicate criticism and opposition.18 Restricting new opportunities for democratic expression and mobilization,19 and by consequence the digitally enabled array of civil, political and economic rights (such as the right to work and education; freedom of expression)20– just as citizens have become more connected and engaged – creates a potentially explosive situation. socio-political and economic instability as discontent around governance systems that are not participatory and accountable manifests as protests. Civil society actors are increasingly looking to the private sector for support expanding their space to operate.27 The case for business leaders to promote openness is not always immediately apparent, because shrinking civil society space may not directly impact their core business in the short term. 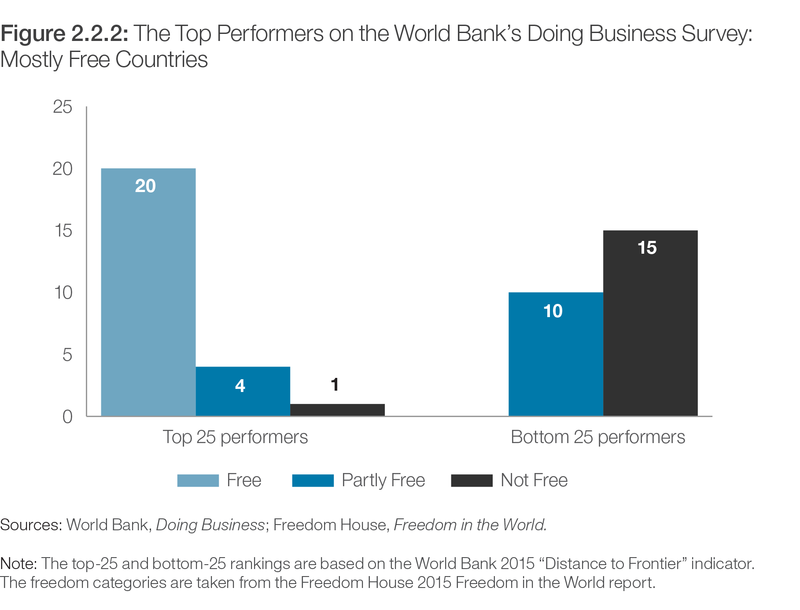 But studies show a long-term link between democratic systems and increases in GDP per capita,28 and most of the top performers in the World Bank’s Doing Business ranking are free countries (Figure 2.2.2). Finally, against the backdrop of ongoing pressure on economic and societal actors to deliver on the SDGs through partnerships and cooperation, it is in the interest of corporations to promote an open space where civil society actors can thrive and cross-sectoral partnerships develop. Restrictions to the civic space risks endanger the ability of businesses to achieve their SDG targets. How Could Business Help to Keep the Civic Space Open? Considering the complex nature of this challenge, some businesses have preferred to come together in coalitions to collectively raise their voice for the promotion of rights and freedoms in the contexts they operate. Examples include the Open for Business coalition,40 which supports LGBT (lesbian, gay, bisexual, transgender) diversity across the world. Despite the global nature of closing civil society space, there is still not much awareness among businesses, decision-makers and a good part of societal actors about this worrisome pattern and the potential risks it can engender: increased social and economic instability, augmented social polarization, more fragile governance, and major detriment to basic civil and political rights that have been gainfully acquired by many countries in the past 50 years. More investment should be put to further study this phenomenon and quantify it in terms of lost economic and social opportunities. With technological innovation creating new opportunities for social inclusion and civic empowerment, time is ripe for all actors to come together and enable an open civic space by collectively taking measures and engaging technology to address this risk effectively. Chapter 2.2 was contributed by Silvia Magnoni, World Economic Forum, and Kira Youdina, World Economic Forum. ———. 2016b. State of Civil Society Report 2016: Executive Summary. CIVICUS. http://www.civicus.org/images/documents/SOCS2016/summaries/State-of-Civil-Society-Report-2016_Exec-Summary.pdf . Indexes can also be found in USAID’s CSO Sustainability Indexes for Sub-Saharan Africa, Asia, Europe and Eurasia, and Middle East and North Africa. The Economist. 2014. “Donors: Keep out”. The Economist, 13 September 2014. http://www.economist.com/news/international/21616969-more-and-more-autocrats-are-stifling-criticism-barring-non-governmental-organisations. Enjolras, B. 2015. “Measuring the impact of the third sector: From concept to metrics”. TSI Working Paper No. 5, Seventh Framework Programme (grant agreement 613034), European Union. Brussels: Third Sector Impact. Florini, A. M. and P. J. Simmons. 2000. “What the world needs now?” In The Third Force: The Rise of Transnational Civil Society, Ann M. Florini, ed. Tokyo and Washington, DC: Japan Center for International Exchange and Carnegie Endowment for International Peace, pp.1–15. Jafar, A. 2011. Women’s NGOs in Pakistan. New York: Palgrave Macmillan. McCoy, J. and H. Heckel. 2001. “The emergence of a global anti-corruption norm”. International Politics 38 (1): 65–90. OHCHR (Office of the United Nations High Commissioner for Human Rights). 2014a. A Practical Guide for Civil Society: Civil Society Space and the United Nations Human Rights System. Geneva: Office of the High Commissioner for Human Rights. Ralchev, P. 2004. “The role of civil society in fighting corruption and organized crime in Southeast Europe”. Journal of Southeast Europe and Black Sea Studies 4 (2): 325–31. Rutzen, D. 2015. “Aid barriers and the rise of philanthropic protectionism.” International Journal of Not-for-Profit Law 17 (1): 1–41. Themudo, N. S. 2013. “Reassessing the impact of civil society: Nonprofit sector, press freedom, and corruption”.Governance: An International Journal of Policy, Administration, and Institutions 26 (1): 63–89. Unmüßig, B. 2016. “Civil socity under pressure – shrinking – closing – no space”. Berlin: Heinreich Böll Foundation. 1 The Economist 2016; Kerry 2015; Sherwood 2015; Stone 2015. 2 The World Bank definition for “civil society” refers to “the wide array of non-governmental and not-for-profit organizations that have a presence in public life, expressing the interests and values of their members or others, based on ethical, cultural, political, scientific, religious or philanthropic considerations. Civil Society Organizations (CSOs) therefore refer to a wide of array of organizations: community groups, non-governmental organizations (NGOs), labor unions, indigenous groups, charitable organizations, faith-based organizations, professional associations, and foundations”. See World Bank 2013. 3 United Nations General Assembly 2016. 4 United Nations General Assembly 2015. 5 CIVICUS 2016c, pp. 5, 8. 7 CIVICUS 2016b; Sriskandarajah 2016. Indexes can also be found in USAID’s CSO Sustainability Indexes for Sub-Saharan Africa, Asia, Europe and Eurasia, and Middle East and North Africa. 11 There are many examples of the vilification of or smear campaigns against civil society organisation, painting them as working against the interest of citizens. See Green 2016; Hungary Matters 2015; UN News Centre 2016. 12 Widespread protest movements, empowered by new technologies, have threatened those in power, thus triggering clampdowns. See Green 2015; Minder 2016; Sherwood 2015. 15 Examples include interrupting the internet before or during protests, blocking certain websites, or mass surveillance impinge on digital rights. Numerous cases exist around the world: see Article 19 2015; Mavhinga 2016; Ramdani 2011; RFE/RL 2016; Sutter 2012. 16 Boon 2015; ICNL 2016b; Sherwood 2015. 18 It has to be noted that available research on the incidence of NPO (non-profit organisations) abuse for terrorist financing and money laundering is limited and of low quality, and no study has been able to reliably quantify this risk of abuse. 19 Green 2015; Omidyar 2014; Treisman 2014. 21 Oxfam International 2016; SIPRI 2016. 23 Florini and Simmons 2000; McCoy and Heckel 2001; Ralchev 2004. 24 Bequelin 2014. Reporting on political issues, corruption and economic trends becomes difficult (see Otis 2013). 25 Researchers are still debating and clarifying the methodological approaches to defining civil society and measuring its impact (see Enjolras 2015). 26 Salamon et al. 1999. 28 De Lombaerde and Garay 2006. 31 In Venezuela, for instance, a repressive and populist regime has, over time, imposed its controls on companies, seizing private businesses and farms and restricting the economic influence of major corporate actors. See Forero 2016. 33 Hunt, Layton, and Prince 2015. 34 Such countries are mirred by corruption and political instability, which is linked to brain drain according to research (see Dimant, Krieger, and Meierrieks 2013 Brain drain, for instance, is heavily affecting Russia-based enterprises (see Holodny 2014). 36 One such example includes the Bishkek Business Club, which lobbied the Kyrgyz government not to accept a “foreign agent” bill that aimed to restrict foreign funding for non-profit organisations. The club argued that the bill went against the Constitution, principles of good governance, and enabling conditions for sustainable economic growth. 37 In private interviews, activists indicate that they have been able to partner with progressive corporations in some of the most difficult environments. Other examples include businesses standing up for LGBT rights all over the world; see Griffin 2015. 41 ACT Alliance and CIDSE 2014; intrac for civil society 2014; Mendelson 2015.